John A. Harrington Jr., professor of geography at Kansas State University, received a lifetime achievement award at the American Association of Geographers annual meeting April 6 in Boston, Massachusetts. Harrington has been at K-State since 1994 and was department head from 1999-2005. He earned his doctorate from Michigan State University in 1980 and was on the faculty at Oklahoma, Nebraska, New Mexico State universities, and Indiana State University before coming to Manhattan. Throughout his career, Harrington has taught and researched topics in climatology, with an emphasis on using the synoptic approach to better understand major weather and climatic events. His regional emphasis has been on the central portion of North America, which has a steep west-to-east precipitation gradient and where year-to-year and decade-to-decade variability is pronounced. 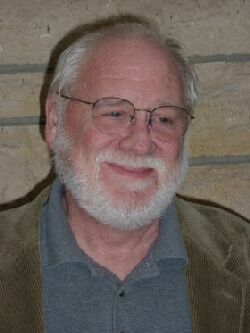 Connected to his climatological work, Harrington has emphasized the practical relevance and applied nature of physical and human-environment geography. In the late 1980s, he contributed to a U.S. Agency for International Development-funded project in western Africa. His efforts involved taking advantage of weather satellite data receiving to capture real-time imagery for analyzing the status of pasture grasses across the Sahel zone in Niger. Activities for the Niger Ministry of Livestock created the first operational geographic information system in the country. Harrington worked with colleagues at the U.S. Department of Agriculture's Agricultural Research Service National Agricultural Water Quality Laboratory for more than a decade, using satellite remote sensing and GIS in assessment of lake and reservoir water quality. Their biophysical approach to lake monitoring enabled the team to estimate the level of suspended sediments in near-surface waters to ±25 mg/l. As an administrator and faculty member, Harrington has been an advocate at K-State for all-university collaboration in GIScience and in natural resources and environmental science. He directed the natural resources and environmental science secondary major from 1998-2001 and chaired the All-University GIS Steering Committee from 2004-2007. After coming to K-State, Harrington's research emphasis shifted to collaboration in multiyear research efforts that addressed aspects of human-environment relationships for parts of Kansas. The Global Change in Local Places project, which was funded in part by NASA, examined greenhouse gas emissions from southwest Kansas along with the economic factors and human decisions that were driving the emissions. Next came the Human-Environment Regional Observatory, a six-year effort funded by the National Science Foundation. The team of K-State geographers collaborated with colleagues from Pennsylvania State University, Clark University and the University of Arizona to compare and contrast the changing nature-society relationship at the four local regional observatories. Both the Global Change in Local Places and Human-Environment Regional Observatory projects resulted in books that document the scholarly contributions of the collaborations. During the past decade, Harrington contributed to two Kansas NSF EPSCoR projects on Ecological Forecasting and on Climate and Energy, and to the NSF-funded Climate Change Education Partnership. Community engagement has been a recent emphasis for Harrington's efforts. Since 2007, he has coordinated the Kansas Geographic Alliance, a group of volunteers who support K-12 teachers and the teaching of geography in Kansas schools. In addition, Harrington coordinates the state-level competition of the National Geographic Bee for the National Geographic Society. Harrington has mentored more than 25 masters students and 10 doctoral students to their graduate degrees. Harrington's lifetime achievement award was presented to him by his geographer colleagues from the Climate Specialty Group. In accepting the award, Harrington discussed his mindset of hoping to leave the world in better shape as a result of his efforts and the roles of prior lifetime achievement award winners in supporting his growth as a professional.